"We are increasingly required to adopt alternative fee arrangements for clients who prefer low cost over quality, and we struggle with whether or not to lower our rates and take a loss or just walk away from non-profitable business and focus on clients who value us. We need help on a case by case basis deciding the right way forward." 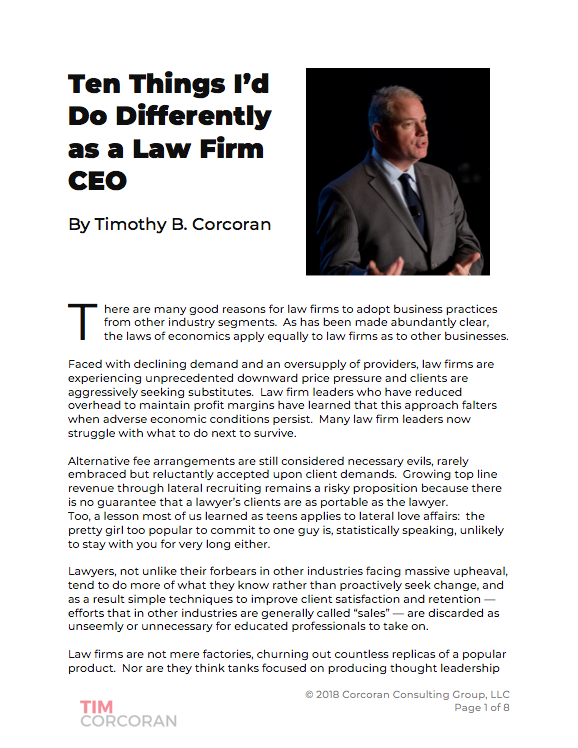 Law firm leaders who embrace the assumptions contained in this scenario, or who are leading lawyers sharing these assumptions, are constantly looking for methods to reduce the pain associated with this new normal. Just as professional athletes need to play through chronic pain as the season wears on, many lawyers seek techniques to help them valiantly soldier through the many new obstacles. I disagree with a number of the assumptions contained in this scenario, but it's no wonder that lawyers who operate under these assumptions struggle to adapt. So let's tackle this head on: the changes taking place in the legal profession are good for lawyers and for law firms, so long as we're willing to let go of a few long-standing and outdated assumptions. Clients always care about quality. But they define quality differently than you do. In business, financial predictability is critical. The legal function, whether managed by a chief legal officer, a general counsel or a vice president of finance, is now subject to the same demand for certainty as the rest of the business. Law firms that embrace predictability and all that this means (including proactively managing expectations when circumstances change), are considered to be higher quality and valued more as trusted advisors than those law firms that distinguish themselves solely on the quality of the work product. Few matters require the best legal team in the world; every matter requires some measure of predictability. Revenue is not the same as profit. Billing hours generates top line revenue. It's the starting point for all the calculations that lead to firm profits. But it's not the same. If I can lower my cost of production and delivery, and lower my organizational overhead, I can generate a higher profit even when revenues are flat or declining. A matter that bills 250 hours at $450 per hour generates $112,500 in revenue, which at a 24% margin nets $27,000 in profit. A matter that bills at a flat rate of $75,000 and generates a 35% return nets a profit of $26,250. How many matters can you have win if you offer to do the work for $75,000 rather than $112,500? Or more realistically, how many matters can you win if you offer to do the work for $75,000 rather than refuse to quote any estimate, because "legal matters are inherently unpredictable?" Alternative Fee Arrangements can be profitable. Lawyers raised on a billable hour revenue model tend to believe this is the only way, or at least the ideal way, to generate revenues. But as we've seen, there are other ways to generate profits. The secret to unlocking the value of alternative fee arrangements is this: only those with experience have enough of a learning curve to find efficiencies in the delivery of a legal service. The firm down the street that merely lowers rates to win work won't win if the prospective client, or the procurement officer, isn't first convinced of their subject matter expertise. Knowing your practice gets you in the game. Offering predictability and efficiency based on that knowledge wins the work and generates profits. This fundamental truth is the driver of profitability in nearly every other line of business. Discounts don't provide predictability. This is a mistake too many clients make. Because it's hard to create legal budgets, and sometimes even harder to manage to a legal budget, it's easier for a client to just demand a discount or for a law firm to just offer a discount and then operate on an hourly-fee basis. After all, that discount conveys to the powers-that-be that we've negotiated in good faith and saved money, doesn't it? But no CFO is fooled by this. A matter that takes 200 hours at $425 per hour is obviously lower than that same matter billed for 200 hours at $450 per hour... but it's still more than the $75,000 flat fee the experienced firm down the street is offering. Merely discounting rates without also addressing the cost of delivering legal services will dilute profits every single time. If you have a process to vet discounts but don't have a corresponding process to address service delivery, you are pouring profits down the drain. Relationships still matter, but it's important to focus on the right relationships. We can walk away from clients demanding discounts or alternative fee arrangements. But to what end? Assuming buyers are increasingly armed with better information about the value of legal services, then who is our preferred target market -- GCs and CFOs who are so singularly unskilled in their roles that they won't seek to find or measure value? Clients who are so loyal to us that we can overcharge them again and again? It's more important to establish and nurture relationships with those clients and prospective clients whose business challenges closely match our capabilities, and whose industry or even geographic footprint closely match our own, allowing us to serve their needs efficiently. Some buyers seek value (they will pay market rates for legal services from established providers) whereas others merely demand irrational discounts from everyone. It's critical to determine the tipping point in your practices so you know which relationships to pursue, and which to discard. Profit is a more informative driver of compensation than revenue alone. Many firms have a compensation system which rewards fee origination. The lockstep firms pay increasing amounts for tenure, regardless of contribution. Both are dumb models, or at least incomplete models. A key challenge with favoring fee origination is that such models ignore the cost of delivery. A partner who generates $1.5 million in fees but consumes resources and overhead equivalent to $1.2 million nets $300,000 or a 20% profit margin. A partner who generates $1 million in fees but consumes resources and overhead equivalent to $600,000 nets $400,000 or a 40% margin. In many firms, the first partner would be more handsomely rewarded than the second. It's far more nuanced than this, but directionally you can see the conflict. It's a similar challenge with a lock step firm -- if you want innovation and efficiency in order to drive greater profits, then reward those who convert experience into efficiency rather than merely reward experience. While the initial outreach from some of my clients may be a plea for help to avoid the pain of adapting to the new normal, we often find that a good strategy generates plenty of positive rewards for partners and leaders alike. Instead of pushing partners into painful change that they don't want, we provide a roadmap to pursue a more pleasurable outcome and the partners come along willingly. In your own firm, do you find yourself lamenting the loss of the old ways moreso than you look forward to tomorrow? Perhaps you've heard of the man who visited his doctor and cried, "Doc, it hurts when I do this." The wise doctor simply said, "Stop doing that." Isn't it time your firm pursued pleasure over pain?